The story of Pasha began on February 23, 2015. He was born prematurely at 28 weeks of pregnancy weighing 1400 g. His Apgar score was 6. What has happened next? Frightened faces of the doctors (and there was a reason to be frightened: Pavel had two brain hemorrhages: on the first night of life, and on the third day); then the words “no one wants to find himself in such a situation. “What situation?” – I looked at my son and did not understand. He is healthy and beautiful for me, only smaller than the others”. A week later the child was admitted to the national research center “Mother and Child”, where he was on a ventilator for one month. 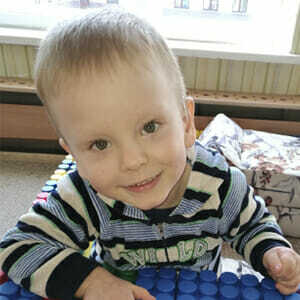 Next month Pavel spent in the hospital, and the situation was slowly getting better. “Pavel is our hero. He came through such number of difficulties, that can seem impossible even for an adult: three blood transfusions, neonatal jaundice, pneumonia, ventriculitis and retinopathy. He was diagnosed with congenital heart disease and atrial septal defect”. After the long hospital stay everyday work began: consultations with doctors, analyses, medicines. At the age of three months he was diagnosed with lactase insufficiency, three months later – with sensorineural hearing loss. In spite of everything parents don’t give up. “We give our son things of different sizes and shapes to touch, try to benefit from musical therapy and hippotherapy. Of course we follow our doctor’s recommendations and do all the exercises”. But the most important thing is that the situation is getting better: the child is more active, eyesight and hearing are improved.